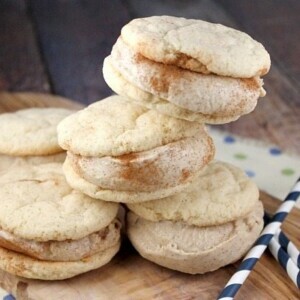 There is no cookie on this planet that makes me happier than a snickerdoodle. 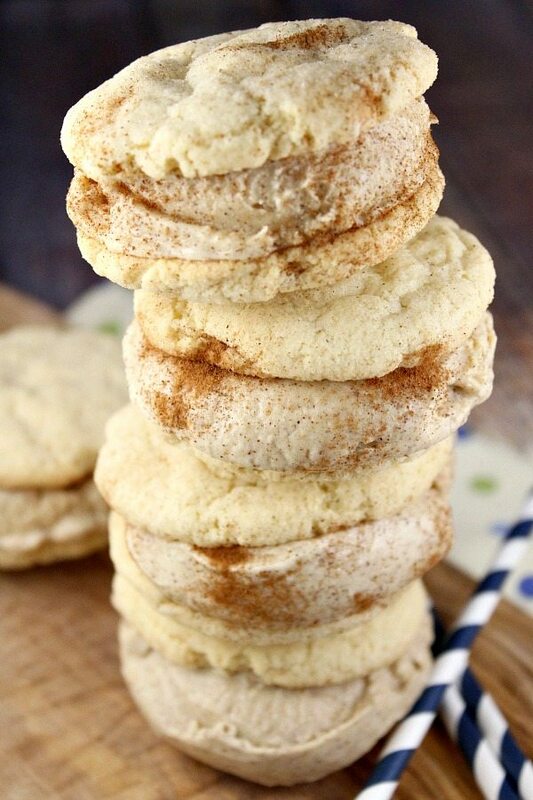 It’s like a sugar cookie overdosed with cinnamon. And for a non-chocoholic like me, it’s a cookie-lover’s dream. Add that to some homemade cinnamon ice cream sandwiched in the middle, and you’ve got like the best summer dessert ever. 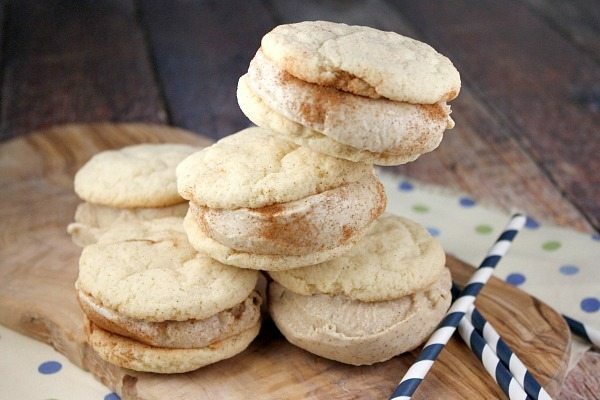 Snickerdoodle Ice Cream sandwiches- genius! 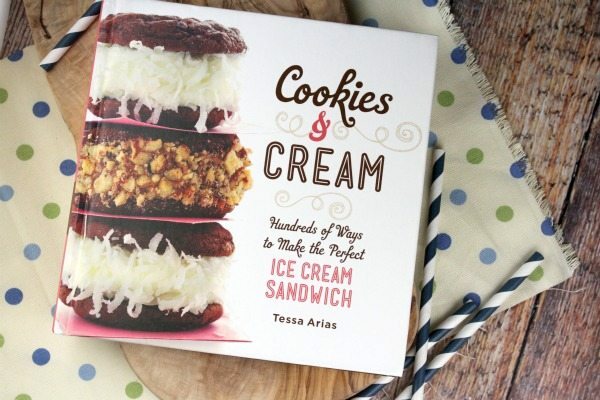 This recipe comes from Cookies & Cream- Hundreds of Ways to Make the Perfect Ice Cream Sandwich by Tessa Arias. Tessa is the blogger behind Handle the Heat. She’s a very talented recipe developer who shares delicious, from-scratch recipes with her readers. Her cookbook is such a fun book for summer- more than 50 combinations of homemade ice cream recipes paired with homemade cookie recipes to make the ultimate frozen summer desserts! You’ll find things like Strawberry Cheesecake, Red Velvet, Boston Cream Pie, and of course, Cookies and Cream. Also included are more than 200 ideas for mixing and matching the cookies and ice cream for a new creation every time, information on assembling, equipment, and decorating, and delicious full-color photos throughout. It’s a good one to have on hand for the dessert section of your cookbook shelf! You’ve got to plan ahead to make ice cream sandwiches, but they’re so worth it in the end. Just make your cookies as you would bake a regular ‘ol batch of cookies. Then make the ice cream base and process it through your ice cream maker. Once the ice cream has frozen a little bit, you can assemble… just a small scoop between two cookies, then back in the freezer to freeze completely. 1. Make the ice cream: Prepare an ice bath by filling a large bowl with ice cubes and 1 to 2 cups of water. Place a medium bowl fitted with a fine strainer inside the ice bath. In a medium saucepan, combine the milk, cream, 1/2 cup sugar, salt, cinnamon and vanilla. Set over medium heat, stirring occasionally, until the mixture is warm and begins to steam, about 5 minutes. In a medium bowl, whisk together the egg yolks and the remaining 1/4 cup sugar. Carefully whisk half of the warm milk mixture into the egg yolks- one ladleful at a time, until the egg mixture is warmed. Whisk the egg-milk mixture back into the saucepan. Cook the mixture over medium heat, stirring constantly with a wooden spoon, until the mixture is thick enough to coat the back of a spoon and registers around 175 degrees F. on an instant-read thermometer, about 5 to 7 minutes. Be careful not to boil the mixture! Immediately pour the mixture through the strainer into the bowl set over the ice bath. Let it cool in the ice bath until it reaches room temperature, stirring often. Press plastic wrap against the surface of the custard and refrigerate until well chilled- at least 4 hours and up to 24 hours. Pour the chilled mixture into the (frozen) bowl of your ice cream maker and process according to manufacturer's instructions. Transfer the ice cream to an airtight container and freeze until firm (at least 2 hours or overnight). 2. Make the cookies: Preheat the oven to 350 degrees F. Line two large baking sheets with parchment paper or silpat mats. In a medium bowl, whisk together the flour, baking powder, baking soda and salt to combine. In a large bowl, use an electric mixer to beat the butter, cream cheese, and 3/4 cup sugar on medium- high speed until well-combined and smooth- about 3 minutes. Add the egg and vanilla and beat until combined. On low speed, slowly add the flour mixture and beat until combined. Place the sugar/cinnamon mixture in a small bowl. Roll the dough into 2 tablespoon sized balls, then roll in the sugar to coat evenly. Place the dough balls on the prepared baking sheets and flatten with the bottom of a sugared glass. Bake for 10 to 12 minutes, or until the cookies are set and begin to brown. Let the cookies cool for 5 minutes before transferring them to a wire rack to cool completely. Freeze the cookies until firm. 3. Assemble the ice cream sandwiches: Top one cookie with a scoop of ice cream. 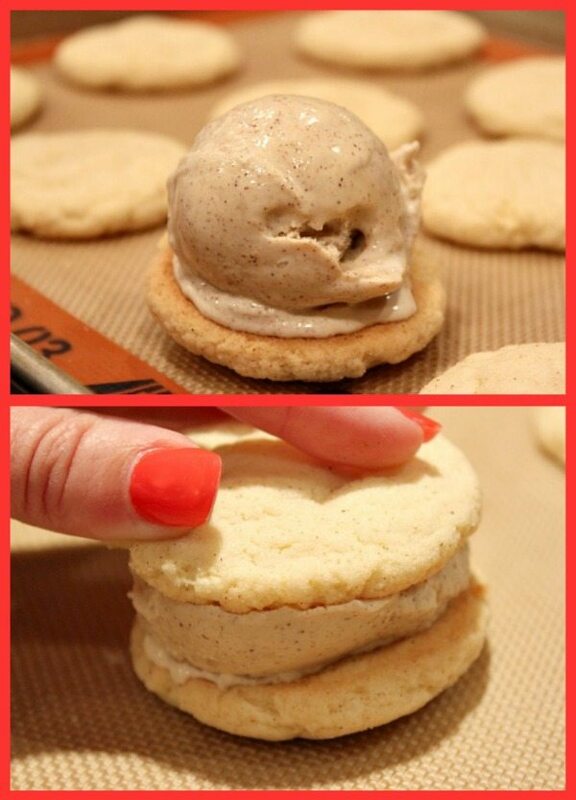 Place another cookie on top of the ice cream and gently press down to form a sandwich. Sprinkle the sides of the sandwich with a pinch of cinnamon, if desired. Immediately place the sandwich in the freezer. Repeat with the remaining cookies and ice cream. Freeze for at least 2 hours before serving. Wrap un-eaten sandwiches to be eaten later. *If your ice cream is too frozen, let it soften at room temperature for 10 to 15 minutes before you try to scoop out ice cream to make the sandwiches. Disclosure: There are Amazon affiliate links within this post.